Sam has been wanting some chewy granola bars similar to the store-bought Chewy Chocolate Chip Granola Bars that his friends eat. I found the following recipe on a website called Make and Takes. Very cool website by the way! In case you are new to my blog, I should explain what I do for recipes. I do not come up with recipes on my own. I am a recipe “recycler” if you will. 😀 I always link to the original recipe as well as publish it on my blog in the original form with my “gluten-free tweaks” or other ideas I have for making something adaptable to other dietary restrictions. All of my own thoughts and substitutions are in red. 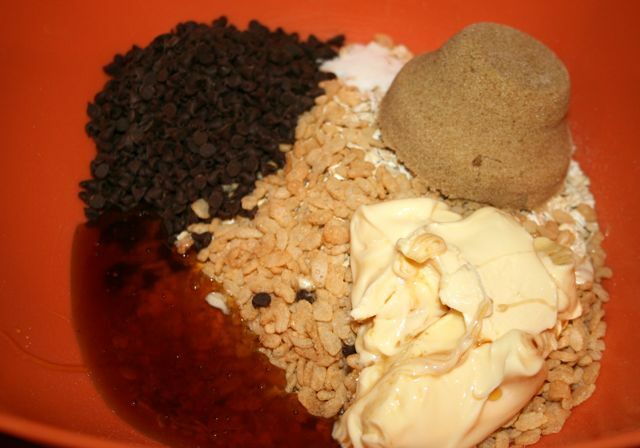 Add all of the ingredients and mix together until combined. Press into a square 8×8 pan (I pressed mine into a 9″ x 13″ cookie sheet lined with parchment paper). Bake at 350° for 18-20 minutes (I cooked mine for 15 minutes in a convection oven). Cool for 10 minutes and score into bars. Let it set completely and then cut into bars. 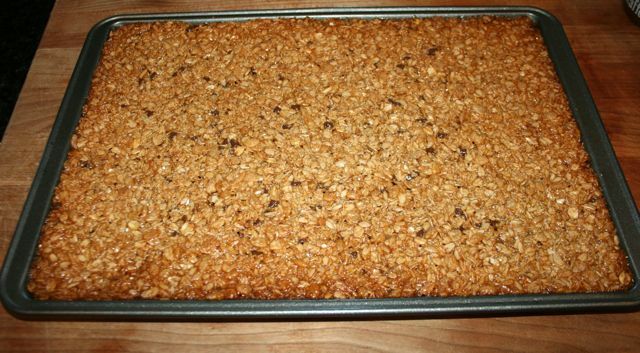 For thinner bars, press mix into a 9×13 pan. They seem to set a little better in the 9×13 pan. 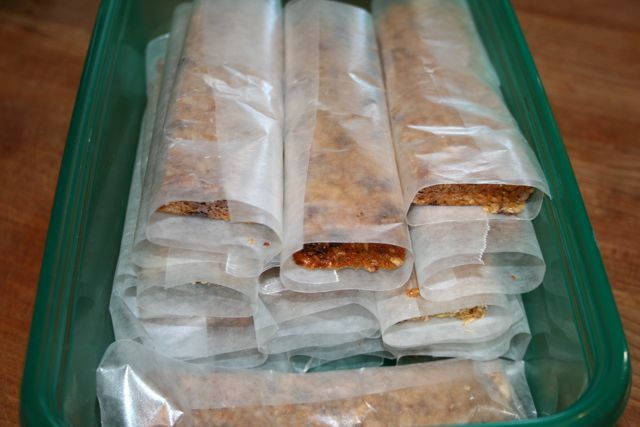 I like to wrap mine individually in wax paper, makes a nice "container" for fast breakfasts on the go! *In case you are newly diagnosed with celiac disease and have not yet read up on adding gluten-free oats into your diet, click here to read the Celiac Sprue Association’s information on oats. if you do decide to add oats to your diet (it would be wise to consult with your doctor on this too because it is advised that your celiac disease is stabilized BEFORE adding oats back into your diet), make sure they are certified gluten-free oats. My personal approach to GF oats are to limit how much we eat. We do not eat them every day and we consume small amounts at a time. YUM!! Can you come & make me some? LOL! Ok, my son was diagnosed with celiac in May, so he remembers eating the quaker chewy bars and keeps asking for them. I found this recipe right away and haven been trying to make them since then. I can not, for the life of me, get these to turn out. I have tried the original recipe as it stands, Smart Balance light instead of butter, 1/4 c of honey, 1/2 c of honey, Karo syrup in both measurements, and they always fall apart (it still gets eaten, it's just more work to clean up). I let them sit in the pan until they are room temp, I have pressed them in, I have just poured the mixture in. I have a convection oven and have also adjusted the baking time and temp several different times. any suggestions? Okay, let me think (I honestly haven't made these since my post in January!). What kind of pan are you using? Ya know, let me make these again tonight (perfect timing since school starts tomorrow!) and I will take detailed notes on any observations I see and report back! I've tried an 8×8 and a 9×13, any thoughts at all would be helpful. I apparently failed to mention that I put the cookie sheet of granola bars in the refrigerator for several hours to firm up! When I remade them a couple days ago, I had the same problem as you, they didn't stick together. That is when it came back to me, I had put them in the refrigerator. After the bars have chilled, let them warm up to room temperature, THEN cut them. It worked great for me, so hopefully that was the issue. Ok, so that worked better, but i still have problems. I'm going to blame it on the living in the NW and all of the awful rain that we get 🙂 Thanks for your help! Cookies were the only thing that I actually really missed and these are about 10 times as good. I used large flake oatmeal, which seems to hold things together well, and cut the bars (and left them in the pan) just before they cooled so they didn't shatter later. Hi my name is Christine and I am contacting you on behalf of Bakery on Main. Our mission is to create products that are good for you, but taste like they aren’t. Today Bakery on Main has over 8 tasty products that are available for a gluten-free lifestyle. Since your blog is focused on just that, if you are interested in reviewing our products we would be more than happy to send you free samples of each. For more information visit our website at http://www.bakeryonmain.com you can also find us on facebook and twitter. We look forward to hearing from you. 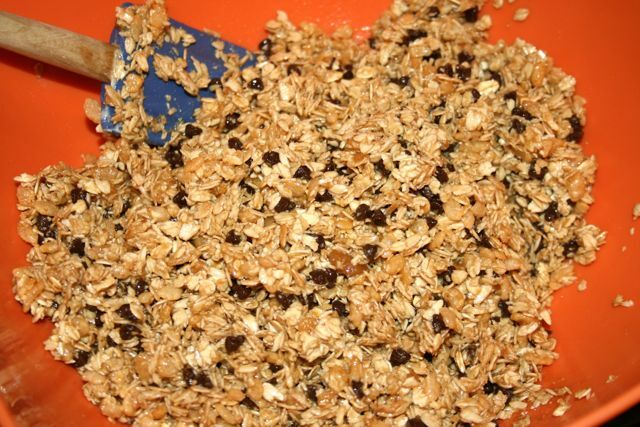 I made these the 2nd time as well and this time I lucked out with the granola bar not becoming a little liquidy. Again I was little short on butter, so just addeda little more than 1/4 cup butter, lined the baking tray with aluminium foil and raised the foil so that it doesnt flow out. Once done, let it cool for sometime and now they are neatly cut and boxed. Thanks for a yummy treat. I'd like to invite you to link this or any other recipe at Foodie Friday (to become a regular Monday event after today). We have regular visitors with food sensitivities, also looking for great new recipes, who are referred by our Nutritionist. I just made these and your banana bread, and they are absolutely scrumptious. Can't wait for my kids to try them after school today! Wow, I just made these and they are awesome! My new go-to Granola bar. Only changes I made were coconut sugar instead of brown sugar (lower glycemic), and I added dried cherries and walnuts. Great recipe. So I just made these and they came out wonderful! Thanks for the idea. I also excluded the coconut and added some flaxmeal. I found your blog from http://www.jeanetteshealthyliving.com [from a link] and I must try this recipe! SO… I don't have Celiac, but I've been put on a gluten-free/dairy-free diet as if I did. I've been eating Kellogg's Rice Krispies by the bowl-full, as they do not have a gluten warning on the label. Are they truly NOT gluten free? Yikes! There are 2 different versions of Rice Krispies – gluten free and regular. The regular ones have malt in them with makes them not gluten free. Just make sure you're buying the specially labeled gluten free ones and you'll be fine. 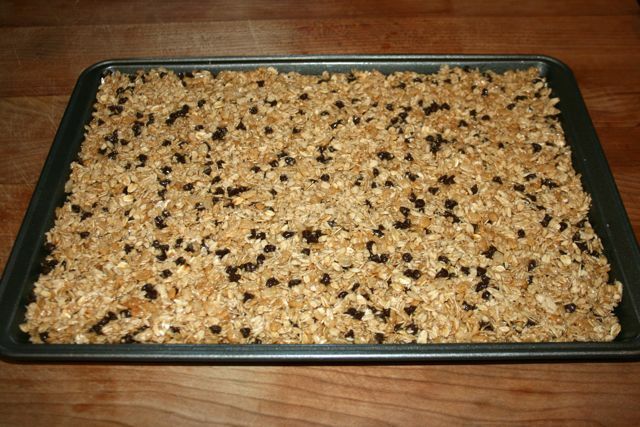 Your granola bars look amazing. We're a granola bar loving household and I'm wanting desperately to get away from individually wrapped bars plus the box. I try to look for gluten free for the health benefits as well.I want to try these this week! Thanks for sharing this GREAT recipe! Made my first batch yesterday. They turned out scrumptously. 🙂 I did put them in the refrigerator as you mentioned in the comments above and I cut them while they were still cold. I packaged them individually in small Ziploc snack bags. 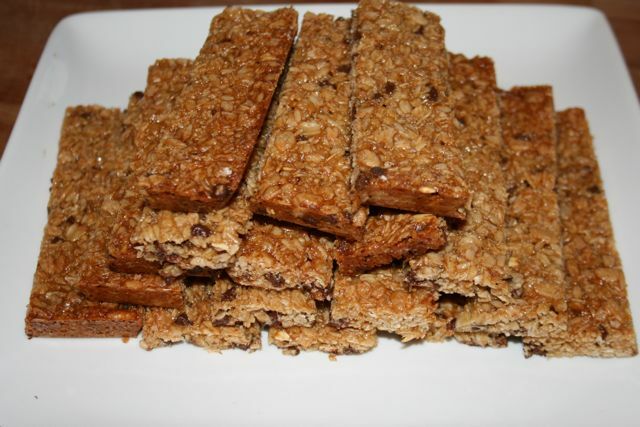 My husband and little sons were thrilled to have such yummy gluten free granola bars. A great recipe for any one…gluten free diet or Not! I just tested neg for Celiac but my migraine specialist thinks my chronic migraines and severely dry skin may be related to a wheat or gluten sensitivity. So I’ve been on a wheat free/low gluten diet to see if my migraines improve. Thank goodness for your site! I was so worried about “quick” foods. I haven’t tried these yet because it looks like the recipe makes quite a few bars. How do you store these? Do you just wrap them in parchment paper and leave them in the fridge? Do you think these would store for a least a week? Thanks! mmm these are yummy…we did the October cook/bake two days ago and this morning I started breaking into these but got distracted cleaning….now I have polished almost the entire pan off because I can’t stop going back. Rice Krispies ow has a gluten free type!!!! Just started making these for myself (no dairy) and my 4 yr old niece (corn, rice, gluten, dairy, apple, carrot, soy allergy). She is so happy to have some of her favorite snacks back. Thanks for posting.